The Field of Dreams is a community park and playground located on Geremonty Drive in Salem, NH. It has been a dream come true for the many volunteers who made this park possible. There is a playground with a dedicated toddler area, as well as areas for older children. Other features of the park include a fitness trail, hiking trails, a stage for performances and picnic areas for families to enjoy the nice weather and the park. There is also a newly-reconstructed volleyball court. We are getting closer! Thank you for the support. Because of your generosity and support, our Field of Dreams Family Fun Day fundraising event was a huge success! 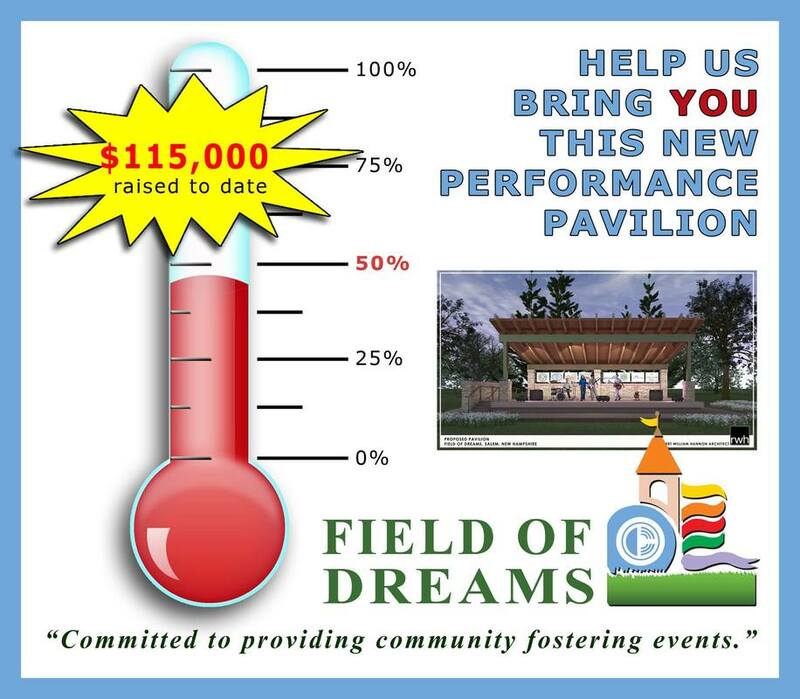 Field of Dreams has reached almost 50% of the pavilion fundraising goal. ​Please contact us if you or your organization has interest in helping us reach that next milestone. As we are moving toward our 30th Anniversary, we are continuing with our capital campaign to replace the current stage with a new pavilion. Our current stage lacks any overhead roofing element. Performers and their equipment are frequently at risk of threatening weather and we’re forced to cancel our concerts. Unfortunately, we have had to cancel many events due to the chance of rain. We have looked into adding a roof covering to our existing stage, however the existing stage structure is unable to support it. We feel the amenities offered at our park should be available to everyone. Our current stage is not handicap-accessible. It’s important for us to construct a ramp that would allow the handicap access to the stage, just like everyone else. We have designed a new pavilion to take the place of the old stage and are now immersed into the fund-raising effort. To bring our ideas to life, we utilized the talents of a registered architect, who is also on our board. We utilized the services of a Construction Cost Estimator to help us identify the probable cost of construction. To date, we have raised more than 10% of the cost of the estimated cost of this project. Local businesses, construction material suppliers, and builders have offered to donate materials and their services to aid in the construction effort. We will achieve our fund-raising goals through these donations, grants, and a sponsorship program. Our Spring Clean-Up is scheduled for Saturday, May 4th, from 8:30 AM to 12:30 PM. We will be cleaning up the debris from the winter and getting the park and playground ready for spring & summer activities. Bring a rake, some gloves, a tarp and a friend or two! 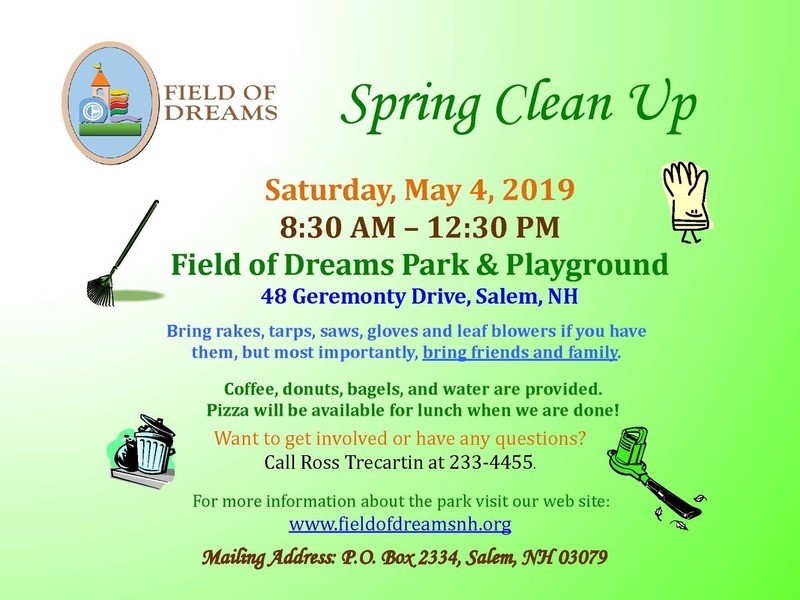 The Field of Dreams Park & Playground is located at 48 Geremonty Drive, Salem, NH. We are across the street from the Salem Court House and next to Salem High School. From I-93, take Exit 1, passing the Mall at Rockingham Park. Cross over Route 28 to Veterans Memorial Parkway. At the blinking light, make a left onto Geremonty Drive. The park is located on the left, with the entrance just past the light pole.